Kristina Elyse Butke: Ready up! It's ColossalCon 2013!! Ready up! It's ColossalCon 2013!! Love that anime and manga! Oh man, oh man! Summer will be here before we know it, and that means it's time to celebrate anime, manga, video games, and pop culture! After finishing my book, my next big writerly project is the fabulously awesome Colossalcon. If you recall, last year I had an absolute blast. It was the first time I presented a writing panel to the public, had my first cosplay experience, and got to meet some really awesome guests as well. And now I'm preparing for my second Colossalcon, with TWO writing panels (!!) and an elaborate cosplay I thought up at the last minute. Oh, and there are like seven guests I want to meet this year. It's going to be great. First things first: THE PANEL DESCRIPTION BOOK IS READY!! Download it here or here. I'm proud to present my panels FANFIC INTO FICTION (on page 15) and GIVE GOOD SPEC! (on page 17). My pal Kitsune Hazard and the AlcoBronies will also make a triumphant return to Colossalcon with BRONIES LATE NIGHT (on page 8). Last year I presented Give Good Spec and tweaked it for this year's convention--deeper content, and no Power Point presentations! Hooray! Fanfic into Fiction is also a Power Point-free presentation, and I'll be going into a variety of topics from why people write fanfic, how it makes you a better writer, and other important stuff like copyright and fair use! Although I get to use the disclaimer, "I am not a lawyer or legal representative of the United States" before I go into it. I ordered some business cards from Moo especially for Colossalcon (they were running a promotion at the time so I got 100 cards for free, yay!) and I get to burn around 100 discs or so of content for my panel attendees. On top of that, my cosplay idea is pretty insane. Last year I wanted to cosplay from Fullmetal Alchemist Brotherhood. I didn't want to bother with sewing at all, and I couldn't find a dress that I could alter reasonably into a Lust costume, so I paid a talented seamstress from Etsy to make my outfit, and it came out really well. Because my health got crappy in the winter, I knew I couldn't fit into my costume again for Colossalcon this year (which made me really sad, although I've lost 8 lbs so far!). I was going to wear my kimono only, but then I watched Gankutsuou: The Count of Monte Cristo and fell in love with the anime's rich, textured visual style. I decided to do a female version of the Count, so at Colossalcon I will refer to myself as Lady Gankutsuou, La Comtesse de Monte Cristo. And since this was a last-minute decision, I knew I couldn't hire anyone to make a costume in time, so I'm doing A LOT OF SEWING this time around. I'm altering pre-existing clothing and doing it all by hand because I hate sewing machines. They scare me and I screw up every time I mess with the bobbin. Blehh. But my progress is slow-going. That one flame I sewed into my jacket sleeve took me hours. And, the fire fabric is really messy and fraying. I tried hemming the flames first to prevent it from falling apart, but the shape got really distorted when I did that. So, I sewed it straight onto the sleeve so the fire could keep its awesome shape, but it looks crappy close-up. Nothing looks clean. I think I'm going to have to outline the flames with some black trimming to make it look more professional. So, I expect this will be incredibly time-consuming, but much more fulfilling since this costume will truly be my baby. I've got a cape (I just need to add the paisley fabric to the lining), the silk fabric for my cravat, a gorgeous black velvet jacket (I need to finish the flames and trim the sleeves with the red/gold pattern), a satin Victorian bustle-style skirt, and white gloves. As far as the makeup and hair goes, I've got that awesome Arda wig you see in the picture: The Claudia in Midnight Blue. I'll pretty much wear it as pictured, except I'll brush out some of the tighter curls at the bottom of the wig. I wanted to get the ears but now I don't think I'm going to bother because I think the wig will cover my ears. But I am going to get vampire teeth. Oh yes. So I need the teeth, the blue skin makeup, and some blue lipstick (since I'm playing the Count as a female). I am worried I'm going to overheat in the costume. 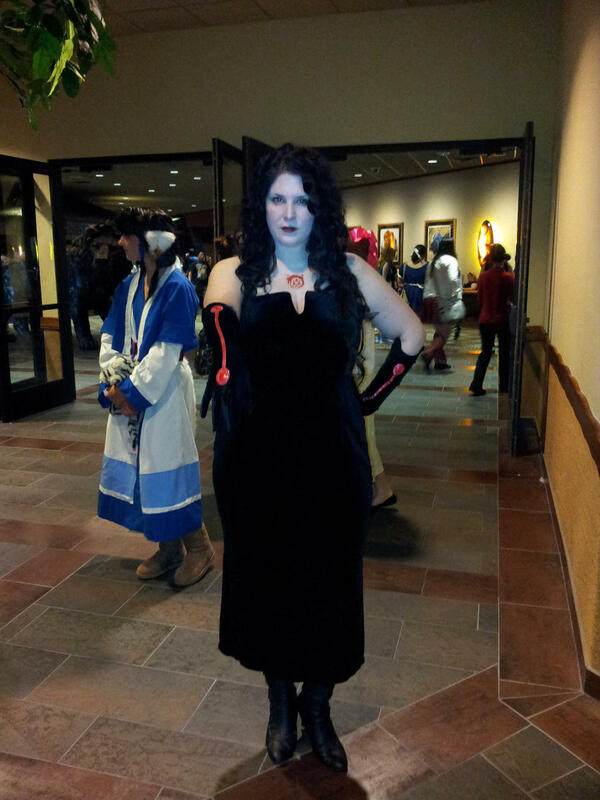 I sweated in my Lust costume last year, but it was because I wore like 30 pieces of hair extensions. I'm wearing a lot of velvet and the hair may be heavy like last year's hairpieces...but at the same time, I know I'll be more comfortable because I'll be wearing PROPER FOOTWEAR this time. I just hope I don't sweat everything off. The convention center at the Kalahari is nice and air-conditioned, but there will still be a lot of people running around. Fingers crossed I don't burn out!! Anyway, I'm so excited about this year's Colossalcon. It's shaping up to be something amazing, AND I HOPE TO SEE YOU THERE!! The Magic of "The Anubis Gates"
How I Finished the Book: Everything Must Go!